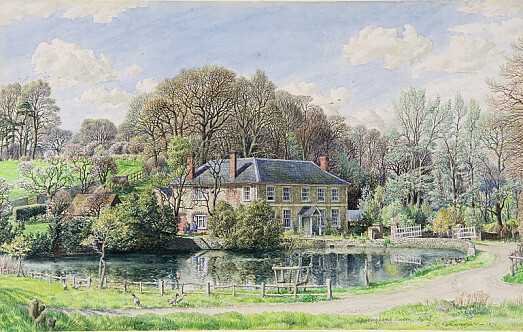 Throughout his career, S R Badmin used his great talents – as etcher, illustrator and watercolourist – to promote a vision of the English countryside and thus of England itself. By underpinning his idealism with almost documentary precision and detail, he was able to produce images that appealed to all, and could be used for a great variety of purposes, from education through to advertising. The well-being suggested by each rural panorama is all the more potent, and pleasing, for the accuracy of each tree and leaf, and the plausibility of the slightest anecdotal episode. S R Badmin was born in Sydenham, London on 18 April 1906. He studied at Camberwell School of Art (1922-24) and the Royal College of Art (1924-27), and began his career by contributing illustrations to The Graphic (1927) and The Tatler (1928). In 1928, he qualified as a teacher, and supplemented his income by teaching at Richmond School of Art (1934) and St John’s Wood School of Art (1936). 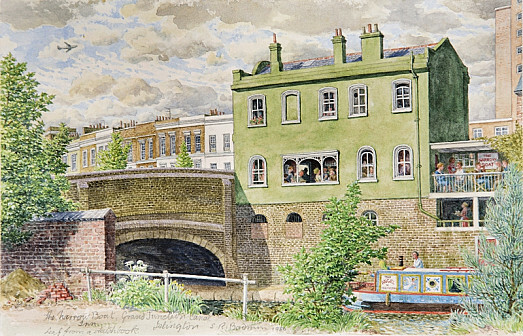 However, he worked increasingly as an etcher and watercolourist, and was soon elected to the Royal Society of Painter-Etchers and Engravers (ARE 1931, RE 1935) and the Royal Society of Painters in Water-Colours (ARWS 1932, RWS 1939). He was also a member of the Artists’ International Association. 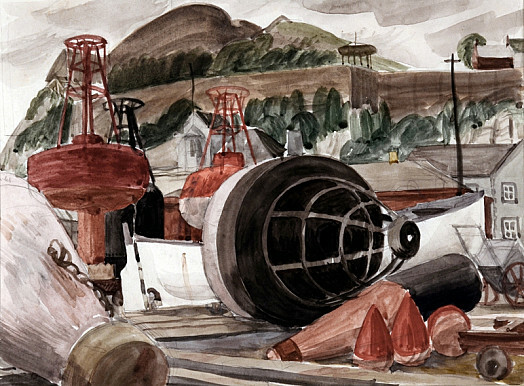 In 1933, he received a major commission – from the American magazine Fortune – to depict various towns in the United States; the results were exhibited in New York (1936). 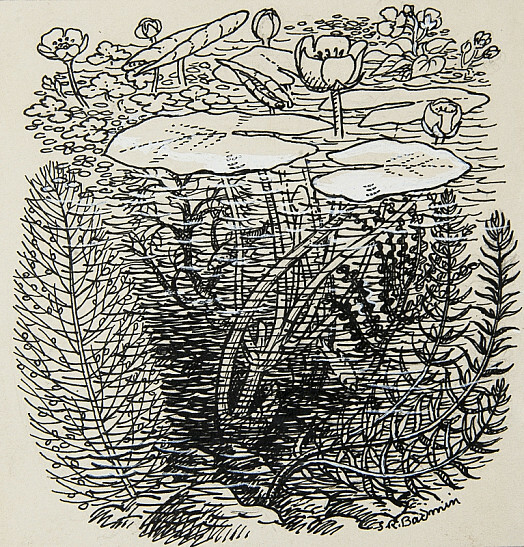 An important development in Badmin’s illustrative style was marked soon after his return to England by Highways and Byways of Essex (1937), a collaboration with F L M Griggs. 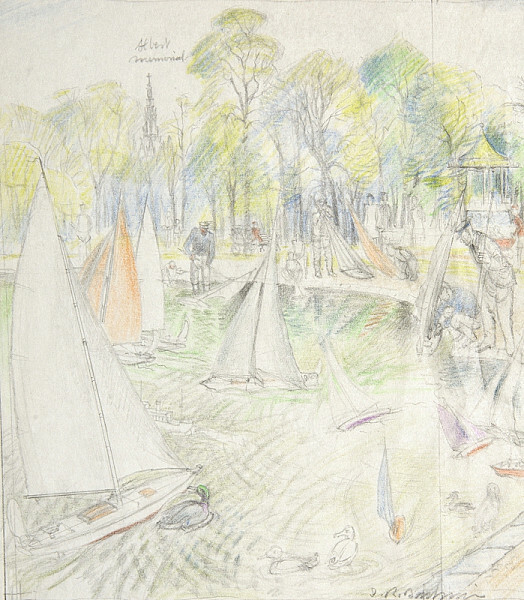 Even before the Second World War, he made a mark as an educational illustrator and was particularly admired for his accurate depiction of trees. Before working in the war, for the Ministry of Information and the Royal Air Force, he made a major contribution, in 1940, to Recording Britain – a term which might well be applied to his work as a whole. 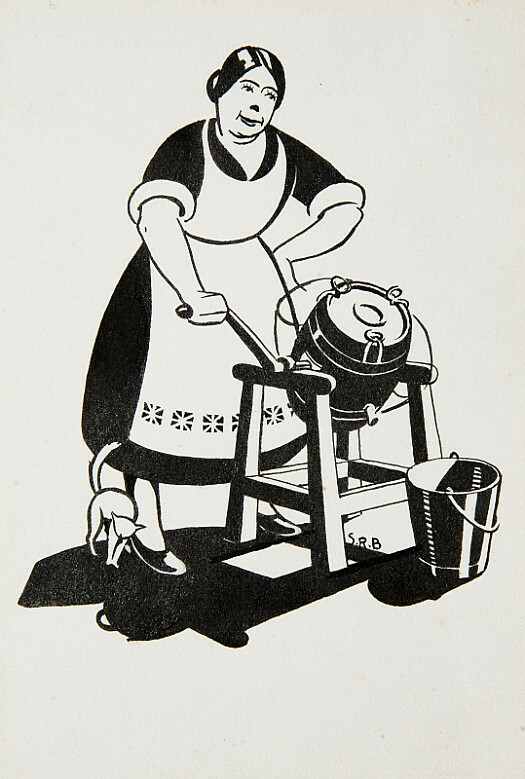 From 1945, Badmin worked increasingly as a commercial artist, designing advertisements and posters, and producing illustrations for greeting cards and calendars. 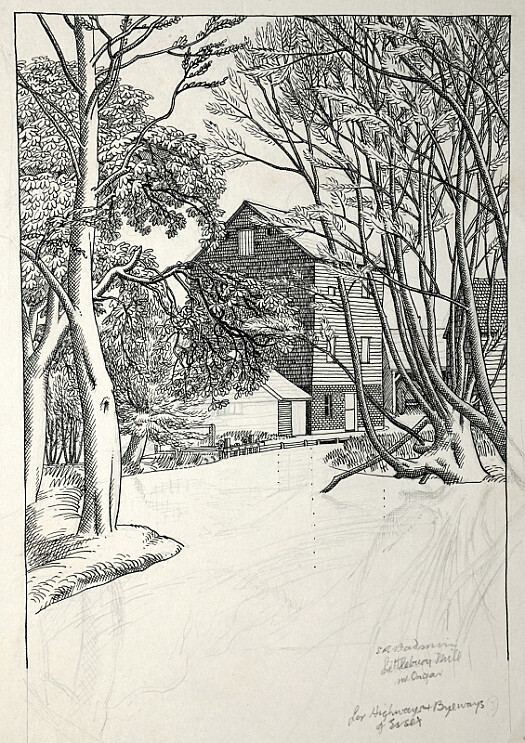 Equally in demand as an illustrator of books and periodicals, he published Trees for Town and Country (1947) and contributed to the Radio Times. Only from the mid 1950s was he able to paint two or three major pieces for each RWS exhibition, and hold a show at the Leicester Galleries (1955). Even then, he found time to embark on projects for Shell: Geoffrey Grigson’s The Shell Guide to Trees and Shrubs (1958) and four volumes of the series of ‘Shell Guides to the Counties’. In 1959, he and his family moved to Bignor, near Pulborough, West Sussex, from where he continued to paint and exhibit. He held a further solo show, at the Worthing Art Gallery in 1967. In 1984, his achievement was honoured by the RWS in devoting a part of its Autumn Exhibition to his work. His etchings are represented in numerous public collections, including the British Museum; the Ashmolean Museum (Oxford); Aberystwyth University School of Art; and the Herbert F Johnson Museum of Art, Cornell University (NY). Chris Beetles has been the leading authority on S R Badmin for the last 30 years, since he mounted a large-scale exhibition and published S R Badmin and the English Landscape (1985). Earlier this year, he presented a further major exhibition of over 200 unseen works, mostly from the Badmin Estate. This was accompanied by the catalogue, S R Badmin RWS: Paintings, Drawings and Prints, which includes a second edition of Chris Beetles’ catalogue raisonné of the prints, a newly-researched chronology,bibliography and a list of exhibitions. Both the original book and the new catalogue are available from the gallery.